My kids are blessed with several “cool uncles” but my brother has become the official science guy for my toddler. He is determined that she enter preschool with a masters level knowledge of the sciences. After an awesome (for the adults) experiment illustrating pH using pureed cabbage and dry ice, we talked about perhaps bringing some of the science down a notch or two to a 2 year old’s level. The pH test. What 2-year-old wouldn’t love this? And that’s how I discovered water beads. 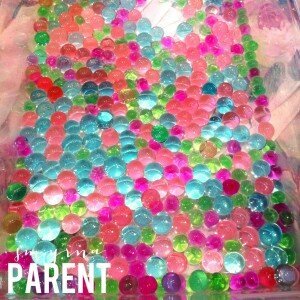 Water beads start as tiny seed-sized beads but they quickly soak up water and increase to the size of small marbles. They are non-toxic and safe as long as your child is old enough to understand that these are not to be eaten. Their texture is pretty unique, making for an awesome sensory experience. And they’re gorgeous! Water beads are originally intended for decorative use in flower arrangements, so you can find them at craft stores like Michaels in the floral section. Of course, they’re available online as well. To get started, pour some of the beads into a large bowl. A little go a long way. Fill the container with water and let them sit the required amount of time (several hours or overnight, depending on the brand). 1. 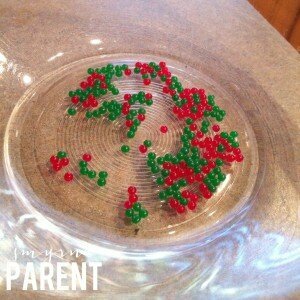 Classic Sensory Bin: Add scoops, ladles, small objects that can be hidden in the bin and fished out, etc. 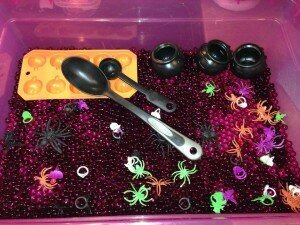 The one below was a Halloween-themed sensory bin done by a friend of mine for her in-home daycare. 2. Color: If you used a variety of colors, children can sort them into different containers by color. Or, use their translucent hues to talk about colors. A yellow bead placed on a piece of blue construction paper will appear green. 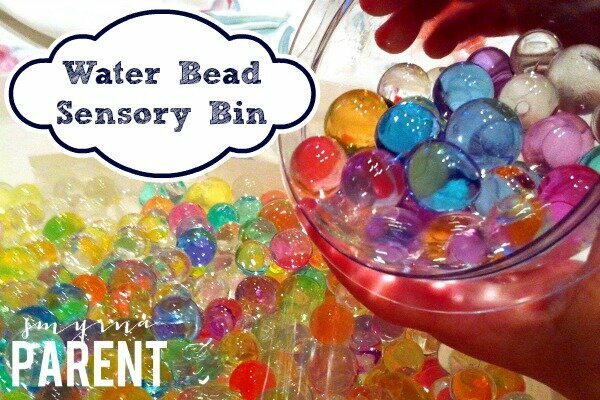 I should also mention that you can make your own colored beads by soaking clear beads in water with food coloring added. They won’t be as bright as the ones shown here, but the softer colors are lovely too. 3. Fine Motor Skills: Using a 2 liter bottle, or something with a similarly small opening, have children move the beads into the bottle. This can prove pretty challenging since they’re slippery little things. And dumping them back into the bin is even more fun – they move almost like a wave. 4. 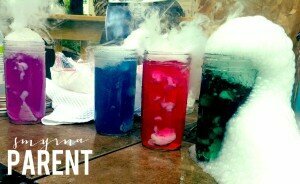 Explore their physical properties: They bounce high, roll far, and disappear when submerged in water (if clear). They are squishy but will pop if too much pressure is applied. When I do this indoors, I place a queen sized sheet underneath the bin to subdue the bouncing and rolling just a little – plus it makes clean up a lot easier. If you’re doing it outdoors, then let them bounce and roll as much as they’d like. And perhaps the best part is that they can be used again and again. They will eventually dehydrate and can be rehydrated by soaking them again. We definitely like having some around for a rainy day…or polar vortex.